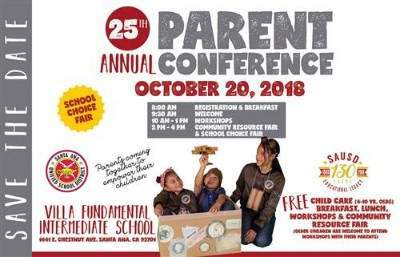 (October 18, 2018) – More than 1,000 Santa Ana Unified School District parents are expected to attend the 25th Annual Parent Conference, which will focus on Saturday, October 20, 2018, beginning at 8:00 a.m. – 4:00 p.m. at Villa Fundamental Intermediate School, located at 1441 E. Chestnut Avenue, Santa Ana. “We all have the same vision for our children – to learn and thrive in a safe environment so that they are successfully prepared to attend college and to work in their chosen career fields, so this conference is a great opportunity for us to connect with our parents and to provide them with valuable resources to support their children’s success,” said Stefanie Phillips, Ed. D., Superintendent of Santa Ana Unified School District. The event will feature a host of workshops and seminars, and community resources, and a school choice fair, that are specifically designed to aid parents in supporting their student’s success. This event is free, and transportation is being provided from a variety of schools in the district to Villa Intermediate School. Childcare will also be available for children ages 4 to 10 years old, as well as breakfast and lunch to all participants. Registration begins at 8:30 a.m., and opening remarks are expected to occur at 9:30 a.m. During this time, parents and children, and event organizers will be accessible for interviews and photographs. At 10:00 a.m., parents will be able to choose from dozens of workshops that will be offered in classrooms. The media is invited to cover any one of the workshops being offered. Beginning at 1:00 p.m., parents will have access to a community and school choice fair.